Loosen each bolt 1/4 of a turn at a time, in stages and in the proper sequence as shown. Turn the shift drum segment "1" to the position shown in the illustration. 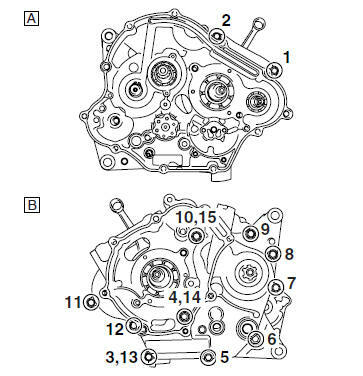 In this position, the shift drum segment teeth will not contact the crankcase during crankcase separation. Tap on one side of the crankcase with a softface hammer. Tap only on reinforced portions of the crankcase, not on the crankcase mating surfaces. Work slowly and carefully and make sure the crankcase halves separate evenly.